For assistance please submit your information via our size inquiry form located within the "size guide page". By selecting "submit" you will be re-directed to the appropriate page. Please review the measurement guide and follow the provided instructions to ensure the measurements are taken specifically for our corsets (our measurement process is different from others). By selecting "submit" you will be directed to our return and exchange page. Please follow the instructions included within that page. Thank you! What Comes With My Corset? How Do I Clean My Corset? We do not recommend washing your corset, because this causes faster wear of the fabric, can dent and warp the bones, and lead to issues with fitting properly. If you must have you corset cleaned, take it to the dry cleaner. If you do sweat with your corset on or if it gets dirty, feel free to gently wipe the liner with a damp cloth. We also recommend wearing a tank top or corset liner beneath your corset to keep the inside of your corset clean. Do You Offer Custom Corsets? Yes we offer both special order fabrics and made to measure corsets on a limited basis. At this time we currently are not accepting custom or special orders, but plan to resume hopefully in the coming year. I was wonder what time frame you where expecting to do custom orders again. At this time we are unsure of an exact date. Due to some improvements were making with our manufacturer, we are hoping to resume again in the fall. Thank you for your patience. Do Your Corsets Yield Results? Are Your Corsets Real? This is a frequently asked question, partially from social media and conflicting information thats been shared. Our corsets are Fully Steel Boned and offer a Steel Busk. Depending on the design and size our corsets have anywhere from 18 – 30 steel bones. Per that Description our corsets are genuine and suitable for waist training. We do not claim our corsets directly result in weightloss, however with a balanced diet and active lifestyle can lead to those results. There are many claims that corsets aid correcting/healing in diastasis recti (if you’re looking to wear a corset in lieu of a medical girdle please consult a doctor). Also many claims that corsets minimize bloat, help reduce the ability to over eat (the pressure helps you to feel full faster), and boosts self confidence to keep you motivated. In this sense you may see results, but we do not promise, and as always we recommend before making lifestyle changes to always consult a medical professional. Which Corsets Are Best for Waist Training? There is some debate as to the best corset for waist training. At the end of the day, it would come down to preference, comfort, and what motivates you daily to lace up! A comfortable corset that you want to wear daily, is a whole lot more effective than an ill-fitting/ uncomfortable corset you dread wearing. Underbust, overbust, or waspie corsets can all be worn for waist training. The most important point is going to always be comfort and fit. The second most important part of that decision is durability. Does your mesh stretch like other brands? We offer two different types of mesh. A non stretchy sports mesh (similar to a sports jersey fabric). This mesh is breathable and lightweight, but is double layered for extra strength. This fabric may stretch slightly over time, but not as much as a fishnet style mesh (and will not have any apparent stretch when pulling on the fabric). Our second mesh fabric is a traditional polyester corsetry mesh. This fabric feels like wire, and does not stretch anymore than cotton or satin. Corsetry mesh is finer in weave and the edges can poke through the binding of the corset (poking or rubbing against your skin). If you find a stray edge has worked its way through the binding, we recommend carefully trimming with nail clippers. This type of mesh is recommended to be worn with a corset liner to avoid irritation. The seasoning period is to allow your body to become accustomed to the compression, as well as allowing the materials to soften. We advise taking your time, slowly tightening your corset, and only keeping at a lighter reduction to start. At a small reduction, start your wearing with shorter lengths of time. You may gradually increase the duration as you begin to feel more comfortable. Please do not tighten all the way down right away. Tightening too much, and too quickly could possibly harm you. Take this time for you and your corset to get introduced. There is no one way to season but the most important part is that you listen to what your body is telling you. Have fun with it! We hope you fully enjoy your investment. Think of it like breaking in a nice new pair of leather shoes! What is the difference between a Stiff Busk and Flexible Busk? How Do i Decide Which Corset I Want/ Why Are There So Many Designs? It is our goal to offer a design for every body type. This is why our collection of designs is constantly growing! Each design is different, either in length, shape or curve. If you feel overwhelmed and need some guidance, were here to help! Where Are You Located? Do You Offer In Person Fittings? You can find instructions for measuring and fitting on our Size Guide page click here to learn more. We guarantee your satisfaction in the quality of our corsets. If for any reason you are unhappy or have chosen the wrong size, you will have a 14 day window (from receipt) to return the item and exchange or accept refund. To receive a refund the item should be in new condition (worn for less than 15 minutes for sizing purposes) and showing no signs of wear. Shipping costs will not be refunded. The customer is responsible for the cost of returning the item. To prevent any dissatisfaction in sizing and fit, we advise all customers to contact us via the sizing inquiry form (located on our “care wear and sizing page”). Please make sure all items sent back are properly packaged and insured. If the item is being exchanged for another product, please provide payment for shipping.For custom garments MystiC City is not responsible for a corset made to incorrect measurements supplied by the customer, or if the customer changes weight or size after the order is placed. NOTE: Used Merchendise will not be accepted. 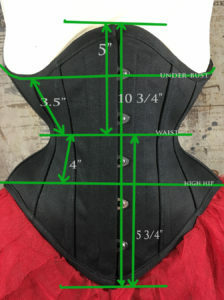 In order for full credit or a refund to be issued, the corset should not indicate wear, be re-laced, missing the modesty panel, or corset storage bag. If your return item is missing any of the above items, or look as if it has been re-laced; a 25% restocking fee will be charged. We use either the provided Priority Mail or Express Mail box for all USPS orders and a plain brown envelope or box for international orders shipped via DHL. Does Shipping Include VAT or GST? MystiC City Corsets will not be held liable for late shipments due to customs regulations, our prices DO NOT include VAT or GST. Please check with your country’s customs office to determine any potential additional costs prior to bidding or buying. International customers are required to cover this cost. Shipping cost is calculated based on live rates direct from USPS. Rates are determined by size and weight. If you order a corset shorter than 13” it will be shipped via USPS Legal Flat Rate Envelope. If you order more than one corset, or the item is longer than 13” it will be shipped via USPS Medium Flat Rate Box or based on weight (whichever is lower in cost). Our system automatically searches for the lowest cost option available. All packages are insured and come with valid tracking. If you do not see an option to ship to your country, please contact one of our representatives so to have your countries shipping cost calculated and added to website. After adding products to your cart you’ll be able to estimate shipping for your specific location by using our shipping calculator located on the cart page. How Long Does It Take To Ship Orders and How Long Until Its Delivered? Do you Ship Internationally? Packages ship by USPS priority mail. Ready to wear corsets are shipped within 24 hours of processing and receipt of payment. Processing can take up to 3-5 business days. packages will ship from our office in Kyle, TX, and can be shipped worldwide. Made to order corsets may take 12-16 weeks to be shipped. Packages shipped internationally may take up to 20 business days to arrive. NOTE: Please order with holidays, and distance of shipment in mind.